Traveling and eating go hand in hand. If you travel, meals you've had can be some of the best or worst memories from your trip. It's usually a lot of fun to try out the local specialties and sometimes other dishes you feel nostalgic for. Then again, if you love a certain type of cuisine, you'll find opportunities to sample the local way of preparing it. Khao Soy is a curry based noodle soup famous in Northern Thailand, served above with the local Northern Thai sausage. Fried Dal with Butter served with Kashmiri Nan. Almost a perfect meal. This particular one is from a restaurant in Little India, Penang. Some of the best Satay you'll ever have. Two ladies were turing and basting the skewers constantly over the charcoal grill. This is a Malaysian version in Kuching, Sarawak on the Island of Borneo, and delicious. Served with cucumbers and an incredible warm chunky peanut sauce. It's not always Pho in a Vietnamese restaurant and although there was Pho on the menu at this restaurant, it's not the main reason people come here. All the finger foods (above) are the big draw here and served with plenty of greens for wrapping. There are a variety of sauces for dipping and single clove garlic (eaten raw). Here's a Chinese/Malaysian noodle dish available just about anywhere in Kuala Lumpur. Simple as boiled egg noodles, tossed in a brown sauce and topped with BBQ pork and greens. Nyonya Cuisine is probably one few have heard of. It's a mixture of Chinese, Malaysian and Peranakan food. Above is a typical appetizer served in little fried pastry cups. A good thing to try while in Malaysia, and particularly in Penang where we sampled it. Also in Penang, Malaysia, we found this great outdoor restaurant serving up an eclectic array of Asian dishes. Plenty of seafood but we opted for pork ribs cooked with Guinness Stout, Gai Lan with oyster/cognac sauce, tofu with lobster sauce and watercress soup. And finally Hainan Chicken. Chicken and Rice restaurants are everywhere in the big cities in Malaysia. Typically served with a bowl of soup (broth) and sometimes with boiled bean sprouts. Many locals swear by certain restaurants serving the "best" Hainan Chicken in all of Kuala Lumpur and they wouldn't eat it anywhere else. We're not as picky but there are some that serve up a mean chicken and rice dish. Singapore is a great eating town and it seems you can get just about anything you want any time of the day. Hawker stalls are organized in clusters throughout the city and are very popular for locals and tourists alike. Alan and I love Indian food and Singapore has a very distinct "Little India" with a wide variety of Indian cuisine to choose from. Sad to say but we didn't try the Curry Fish Head Promotion (above). It does look good though and I can imagine all the tastes and flavors involved. 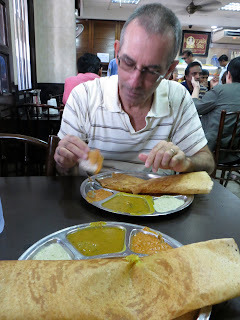 Masala Dosas are one of our favorites and Alan, yes, eating with his fingers (above) can never get enough of it. We came here twice in our brief four day visit this time. Not to worry though. Sinks with soap and paper towels are located nearby for washing up before and after. Our dear friend Casey took us to Bak Kut Teh restaurant near the downtown area. 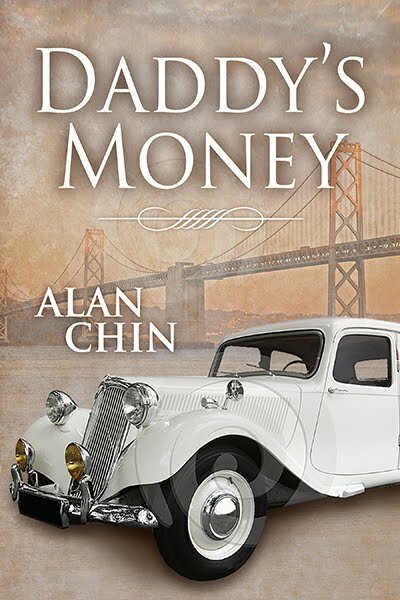 It's a local treat and very popular. Buk Kut Teh involves pork bones boiled for hours creating a wonderfully flavored broth. You eat the meat off the bones and take as much soup as you'd like. Servers will continue to top off your soup until you tell them to stop. Chingay 2013 in Singapore. The 41st Chingay Parade and this year's theme is "Fire In Snow". Yes, there were hundreds of woks filled with flames lining the entire parade route, and "foam" snow during the finale. As usual, plenty of colorful, energetic, people of all ages in the parade. 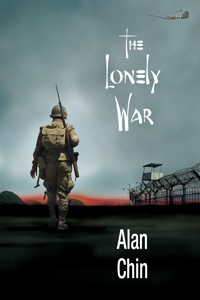 This year 10,000 in the parade and 150,000 spectators on hand. Chingay is the largest annual parade in Southeast Asia. Some liken it to Mardi Gras or Carnival. It's a multi ethnic celebration celebrating the end of the Chinese New Years celebration. Chingay is roughly translated as "Masquerade". It's a two day event so we'll return tonight for more and hopefully some better pictures. Plenty of performers hanging around before the big parade begins. As you wander the streets of Old George Town in Penang you'll come across Steel Rod Sculptures mounted on buildings throughout town. Originally commissioned by the city of Penang to depict specific historic or characteristics of "Old & New" Penang, they were first deemed to be too "Chinese" in their depictions. But over time, most people feel these caricatures of "Old and New" Penang are for the most part "charming". 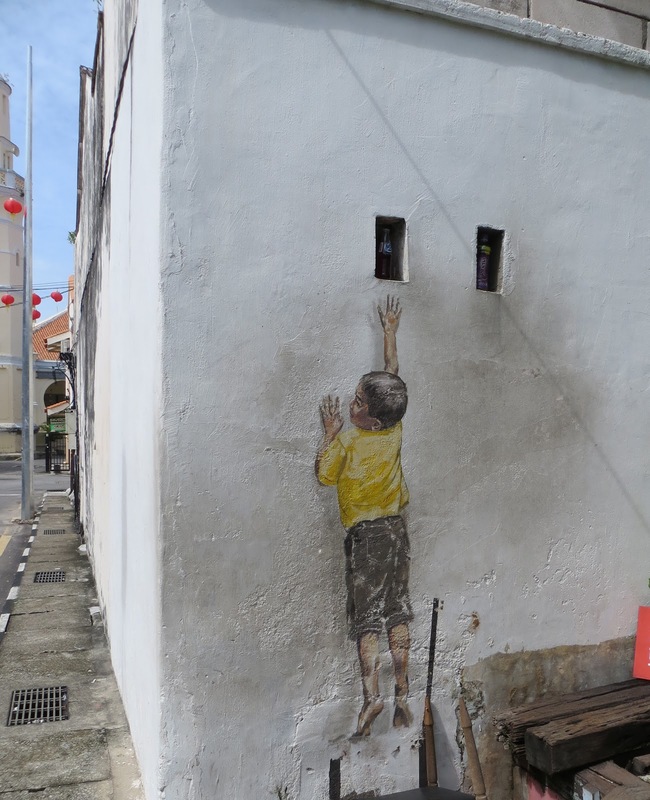 Young Lithuanian-born artist Ernest Zacharevic's wall murals around George Town, Penang. 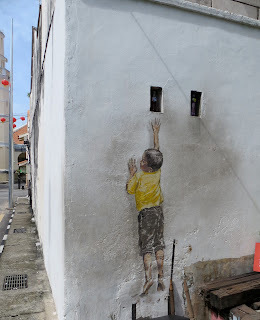 Several murals painted on sides of buildings around the Unesco Heritage Site of Penang in conjunction with the 2012 George Town Festival are known as the "Mirrors George Town" project. See them before they're faded, worn, and gone. The Hokkien New Year is celebrated on the ninth day of the new Chinese calendar each year. The enormous ethnic Chinese Hokkien community in Penang, Malaysia celebrates in grand style. Offerings of food are laid out to beckon good luck and fortune for the New Year. The main celebration here in Penang took place this year at the Chew Jetty. Hokkien are predominately boat people and live close to the water. Several family clans have elaborate homes built on the jettys. We joined thousands of others in the celebrations which began at dusk. An enormous rainstorm hit just about two hours into the celebration and we took cover in a small open air bar (although covered) called Amigos. The downpour lasted 90 minutes. We made our way back to our guesthouse as the weather cleared and the fireworks began. It's the Year Of The Snake and both Alan and myself (Herman) were born during the Snake year so we're hoping for a great year. We're celebrating as we did two years ago in the Malaysian capital of Kuala Lumpur. The city hasn't changed much in two years. Malaysia has some of the best Lion Dancers in the World and they will seldom disappoint. The only disappointment was that we didn't see nearly as many Lion Dancers as we saw two years ago. But nonetheless KL is a great eating town and we did our fair share of it. We arrived from Chiang Mai on Chinese New Years Eve and our hotel in the Bukit Bintang area was charming but right in the middle of where a huge party was going on. There was non-stop music, firecrackers, lion dancers, and some very bad karaoke going late into the night. The second of three days of celebration of the Chiang Mai Flower Festival included a parade snaking its way through town, and yes, creating a massive traffic jam in its wake. Prizes were awarded and presented to the winners the day before and everything was displayed beautifully for all to see. Here we are with some of the very elaborate, flower decorated floats used in the parade.